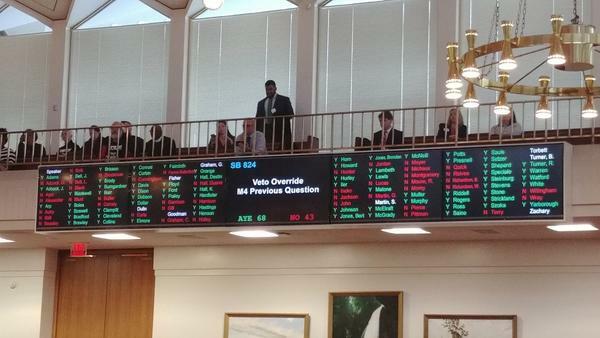 State lawmakers voted on Dec. 19, 2018 to override North Carolina Gov. Roy Cooper's veto of voter ID. The move means photo ID at the polls is now law. The Republican-controlled state Legislature steamrolled Governor Roy Cooper's veto of a newly crafted bill requiring a photo ID for in-person voting in North Carolina. A day after the Senate voted mostly along party lines to override the veto, the House completed the process with three-fifths of the members present supporting the motion, all but one of the 72 yes votes cast by Republicans. That means starting next year, registered voters who wish to cast in-person ballots at North Carolina polls must present a state-sanctioned photo ID. Under the new law, that would include IDs issued by UNC schools, community colleges and private post-secondary institutions. In his comments to the chamber, Rep. David Lewis (R-Harnett) noted the wider array of identification cards that are acceptable under the new legislation. "We have required the DMV to issue ID cards automatically to those with suspended licenses," said Lewis, "which will not only allow those people to easily comply with the law but will measurably improve their lives." Republican lawmakers scheduled a special session to draft enabling legislation for a voter ID constitutional amendment. More than 55 percent of voters approved the amendment referendum in November. The timing of the lame-duck session also allowed Republicans to exercise their veto-proof majority before Democratic gains in the mid-term elections take effect starting next month. But lawmakers like Rep. Darren Jackson (D-Wake) noted that the voters who approved the constitutional amendment were not aware of the specifics of the law when they cast their ballots. "It's helpful to remind ourselves what our state constitution now says," Jackson said to his colleagues, as he urged them to vote against an override. "'Voters offering to vote in person shall present photographic identification before voting.' That's it, that's what it says. Yet, I can stand up here and list dozens of types of photo IDs that won't work." "Is not allowing some valid IDs and many expired IDs narrowly tailored to what 55 percent of the voters have asked for?" Jackson asked. Much of the objection to the photo ID law among Democrats and civil rights advocates is rooted in the state's history of suppressing voting rights for African-Americans and a 2013 GOP-backed photo ID law that was thrown out by a federal court for targeting black voters with "almost surgical precision." "When I talk about history, I talk about the late 1800s, the early 1900s," said Rep. Robert Reives (D-Chatham, Lee). "We're talking about history from 2013 that people are still a little senstive about and if we're going to keep passing bills going through laws and pretending none of that stuff happened we're going to have a tough time next year." Opponents of the new law wasted no time in challenging it. The Southern Coalition for Social Justice issued a statement shortly after the House's override vote that a lawsuit has been filed on behalf of six North Carolina voters claiming the new voter ID legislation unduly burdens the fundamental right to vote and violates the state constitutional equal protection clause. The Southern Coalition for Social Justice handled the lawsuit that got the 2013 voter ID law struck down as racially discriminatory. It looks like the General Assembly will be back in a couple of weeks to handle another veto. Governor Cooper has already indicated he will veto a bill to restructure the state elections board. Lawmakers will return December 27 to take up any remaining override votes.